These preserved quinces, like the preserved apples and apricots, will be a delightful accompaniment to the pancake recipes we posted last week. When I was in kindergarten, our class held an alphabet feast. Each of us was assigned a letter of the alphabet and tasked with providing a food whose name began with that letter. The “A” student could bring apples, the “P” student could bring pie, as the “Q” student I faced a great challenge. But, as always, my brilliant and resourceful mother had an idea: Quince Jam. I’m not sure I had ever tasted quinces before that day when we finally found a jar of imported Quince Jam after visiting what seemed like every specialty store in the western towns of Essex County, NJ. The “Q” student in the the other class may have had an easier time making quiche than hunting for quinces, but I think that my mom and I came out on top. My classmates and I ate quince jam on saltines sitting cross-legged on the classroom floor, or at least that’s how I remember it. I don’t think I tasted quince again until the man who is now my husband poached them in wine for dessert one cold winter evening in London. Recalcitrant and inedible in their raw state, quinces have long inspired fear and love among cooks. Amanda E. Herbert shows how a gifts of “Marmalade of Quinces,” or other sugared fruits, circulated in a female social network in her book Female Alliances: Gender, Identity, and Friendship in Early Modern England. Local, hearty English quinces were softened and tempered with boiling and the extravagant use of imported sugar. Preserved quinces shared between women demonstrated generous consumption of expensive sweeteners and inborn feminine skills at taming the unruly quince. Molly Wizenberg’s recent post on Orangette reflects a twenty-first-century view of this very same issue and offers a great, simple recipe for taming and tenderizing this “esoteric fruit.” Since that early encounter and more recent reintroduction, I’m hooked on quinces. I’ve been making Hugh Fearnley-Whittingstall’s Sticky Quince and Ginger Cake for years now, Nigella Lawson’s Quince Meat is my household’s standard mince pie filling (or at least it was before these came along), and I’ve long admired quince-whisperer Nigel Slater’s recipes. This recipe from UPenn MS Codex 252 instructs cooks in a complex method for preserving quinces in a gelatinous liquid thickened with sugar and pectin from apples and the quinces themselves. Our recipe, below, is a bit simpler. Despite the lengthy description of cooking methods in this recipe, it is easy to streamline and requires very few ingredients. A quick search on Early English Books Online reveals many uses of “apple water,” or water in which apples have been boiled, in culinary and medicinal recipes. For this recipe, it seems to add pectin to the preserving liquid. Peel and core a quince. Slice it thin. Soak in two cups of cold water overnight (or for a few hours depending on what suits your schedule). Drain the quince from the soaking water and put in a pot with 1/4 c sugar and 2 c water. Bring to a boil and then turn it down to a simmer to cook the quince “leisurely” until soft. (I let my quince simmer for about two hours while I was doing other things.) Using a colander, strain out the quinces and discard the cooking liquid. Set quinces aside. Either during the last half hour of cooking the quinces, or after, prepare a jar and make the apple water/preserving liquid. Fill your jar with boiling water and then discard. Put the quinces in the jar. Roughly chop an apple, skin core and all. Put the apple in 2 c water in a pot. Bring to a boil and then simmer for a half hour. Remove the apples and add 1/2 c sugar to the cooking liquid. Boil until the sugar dissolves. Pour this liquid into the jar with the quinces. Let cool before covering. Now, these preserved quinces did not last long in my kitchen. (I eating them with pancake, ice cream, yogurt, cake, etc.) I cleaned my jar with boiling water, but I did not properly can these. If you want to can a batch of these, Marisa McClellan has great advice over here on Food and Jars and in her cookbooks. Unfortunately, the syrup did not become jelly. I think this is partly because the original recipe instructs cooks to discard the pectin rich quince cooking water. On the other hand, perhaps my apple water could have been prepared more effectively. Luckily, the non-jellied liquid made an awesome syrup for the pancakes. Let us know if your quinces jelly! Like Marissa’s “Pancakes” below, these are thinner and eggier than modern American pancakes. The rice adds an interesting taste and texture: they turn out like rice pudding in crêpe form. *Note: I used Arborio rice because it’s what I had; anything you have handy should work as well. Cook rice according to instructions; drain and then cool completely in a covered container. With a hand mixer, stand mixer, or (if feeling in need of an arm workout) by hand, whisk two egg whites until frothy. Stir whole egg into rice mixture, then whites and a pinch of salt. Heat non-stick pan as you would for regular pancakes (medium heat). Pour small pancakes: I used a 1/4 c. not quite filled. Be sure to scoop to the bottom of the bowl, as the rice sinks. Cook until large bubbles form throughout, about 3 mins., then flip the pancake and let brown on the other side. Serve topped with sugar of your choice. These turned out to be tastier than I thought they would, actually. They are, however, somewhat fiddly to make, as the batter is thin (no flour) and prone to breaking when you flip the pancake. Keeping the pancakes on the smaller side and letting them brown thoroughly solved this issue. (Mostly.) The rice adds some nice chewiness and a surprising degree of flavor. If you really wanted them to taste like rice pudding, adding a splash of vanilla or almond to the batter could be great. Zest would work too. Plus, they’re a great use for leftover rice, as the recipe can be scaled to however much you have. Many pancaking possibilities! These pancakes are a precursor to flat, crêpe-like British pancakes and a far cry from fluffy, American pancakes. This doesn’t make them any less delicious than the American breakfast classic, but it’s worth mentioning at the start. These rich pancakes are slightly leavened with beaten eggs and ask to be served with sweet or savory sides. I’ve halved the original recipe. It makes 4 pancakes and serves 2. Double, triple or quadruple as you desire! Combine cream and clarified butter and set aside. Beat egg whites until frothy. I used a hand mixer for this, but a whisk or a standing mixer would also work. Add yolks, then flour, then salt and nutmeg. Finally, stir in cream and butter mix. Let stand for a half an hour. Heat 1 t butter in an 8-inch pan. Pour 1/4 of the batter into the pan and allow it to spread out. Cook pancakes for 1 min on each side. (Flipping is easier after the first pancake.) Serve immediately. These crêpe-like pancakes were deliciously scented with nutmeg and rich with dairy. Served with yogurt and quinces (recipe coming soon), they made a warm and hearty breakfast on a cold morning. Since this recipe does not call for any sugar, it would be easy to take them in a savory direction by serving them with eggs, cheese, fresh sage or dill, or even breakfast meat like sausage or bacon. I’ll be making these again for breakfast, brunch, and dinner. A draw! We liked both of these quite a bit. 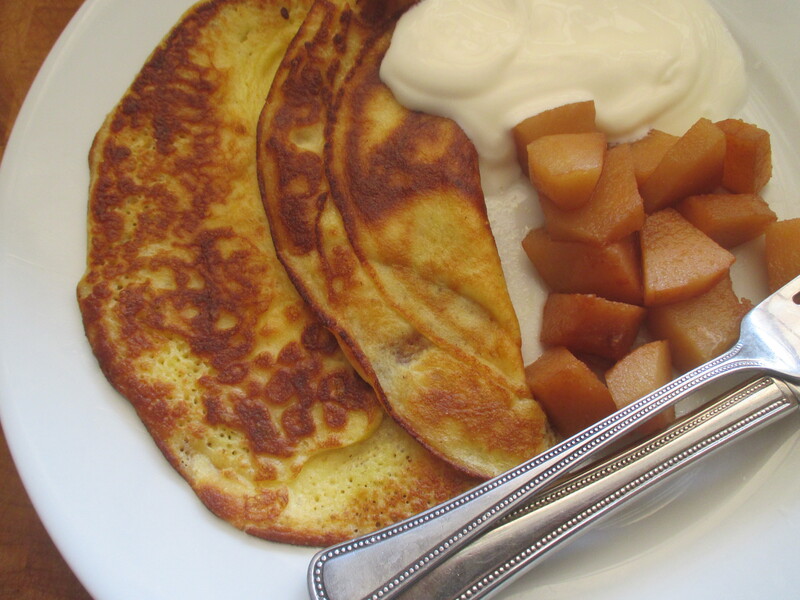 Enjoy either of these pancakes with fresh fruit, yogurt, syrup, honey, nutella, or even preserved apples and apricots. And stay tuned for the recipe for the preserved quinces pictured with Marissa’s pancakes!